In the game, you start out with Ryder at the mission screen. In each mission you’ll have to help save an animal or person somehow, and you’ll take along a few pups to help out. The game plays out like a 2-D platformer, albeit a very easy one with no obstacles or dangers, as this is a game for the very young. Every pup you play as can run, jump, and double jump. Each one has special skills that’ll help them bypass obstacles. Marshal the fire dog has a water cannon, Rocky the garbage dog can recycle materials to build bridges, etc. When you reach an area where you must use a skill, Ryder will prompt players to pick the right one. The neat thing is that while Ryder will tell you which button to push for each skill the first time, on the next challenge he’ll just show the buttons, and it’s up to the child to remember which skill to use. So the game encourages using memory skills. Also, some pup skills require you to fit shapes into holes, so the game also encourages spatial and shape recognition, too. Scattered about the levels are collectables to nab. In each area are 200 pup treats. Nab as many as you can to earn a bronze, silver, gold, or platinum pup treat after each level. Getting that platinum pup treat isn’t always easy, even I couldn’t find them all in every level the first time I played! Also in every level are five golden paw print shields. Find them all to earn a special picture you can view later. And that’s pretty much it. The game looks just like the cartoon, too. My only problem is that each level is a bit similar and repetitive, and Ryder is the only one who talks. And boy does he talk. I know he needs to do that since the game doesn’t require any reading skills, but if he tells me to collect pup treats one more time, I swear I’m going to tape his mouth shut. At least you can lower the dialogue volume at the options screen. Some characters, like Skye the pilot dog and Zuma the lifeguard dog, have swimming and flying sections where you can’t go backwards if you miss a pup treat, which is slightly annoying. But if you have a very young gamer in your life who wants a game made just for them, Paw Patrol: On a Roll is a perfect example of that. Nothing violent or objectionable here. There are no obstacles in the levels that’ll put the pups in danger. If you’re OK with your kids watching the show, they’ll be OK with the game, too. Reading skill isn’t needed, as Ryder tells players everything they need to know. Even when he tells players to push left or right on the joystick, there are picture cues to show the direction as well, so it teaches kids that, too. The levels are a bit long, about as long as a Paw Patrol episode, so kids with short attention spans might lose interest during a level. But there are tons of missions, so they won’t run out of things to do quickly either. It’s nice to see a console game for young kids, as for the longest time, these kind of games were reserved for mobile devices. Just goes to show just how popular Paw Patrol really is! Paw Patrol: On a Roll is rated E for Everyone. The only problem I have with the TV show is that it’s clearly made to sell toys. Heck, everything in the show looks like it could be a cool toy, and it usually is. But the show is so adorable and teaches good lessons so I can let that slide. 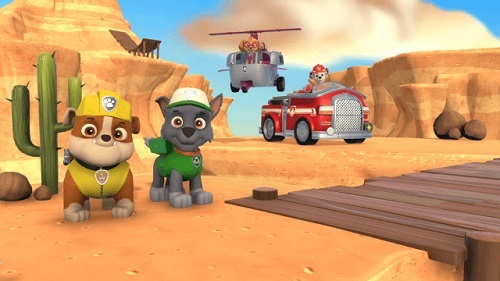 In the comments section, tell me your favorite Paw Patrol pup. Come on, even if you’re an adult, tell me! Be brave! I’ll do it. My favorite is Rocky the garbage dog, because when I was a little kid, I was always fascinated by the garbage truck when it went by every week! Sometimes I try out a kids game just for the heck of it, and sometimes it is good. If I see it on Xbox One, I’ll give it a whirl.